Clean Search is the #1 Reputation firm. Online since 1999, we possess the knowledge, applications, and resources that other firms cannot match. Clean Search is the industry leader in Search Engine Image Protection & Search Engine Reputation Management. We can hide, obfuscate, edit, or remove unwanted internet content, by eliminating the related listings which appear in close proximity to your name. Clean Search is driven to protect your name, stopping and reversing monetary and strategic losses. We provide our clients with a productive clean atmosphere in which to reside, work and prosper on the world wide web. We solve your issue in the shortest time-frame possible. Clean Search will attack your issue with urgency and aggression. While other firms are mailing you forms and instructions, Clean Search has already begun to eliminate the listings destroying your name. Take a look at this screen shot. It's a bid-request for 'Reputation Repair'.. This is the extent of service of virtually all other purported 'reputation repair' firms offer. No knowledge, no infrastructure, no actual concept of associative applications. We have executed campaigns-to-success beyond what other reputation firms have ever conceived possible. The complexity of a successful case can wind through a vast network of internet and social facilities, Clean Search has the infrastructure and expertise to succeed. We have every conceivable facet of online reputation management, investigations, leveraging, etc. needed to empower our clientele. Regardless of what it takes to achieve success. Our results are PERMANENT and RULE COMPLIANT as accepted by Google.com and other major search utilities, giving our results stability and longevity in perpetuity. Clean Search service and applications are guaranteed to be valid, permanent and in compliance with major search engine rules and etiquette. 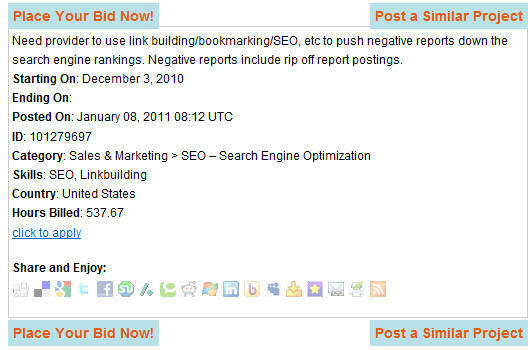 Clean-Search service is designed creat postive listings, and favorable core-relevance.